A cervical epidural injection or cortisone shot in neck can make all the difference when you suffer with chronic neck pain. The debilitating effects of an injury or wear-and-tear condition impact your overall health, your moods and your ability to perform effectively at work and in your chosen sport. Since the cervical epidural cortisone shot side effects are minimal and cervical epidural steroid injection recovery is so brief, it pays to talk to your NYC neck pain specialist about the cortisone injection procedure. Neck pain can really slow you down and affect your day-to-day routines. Whether you’ve been in an accident and got a neck injury or suffer from a degenerative condition that’s damaged the discs in your neck, you need relief from that pain. Unchecked, it often leads to even worse referred upper back pain. 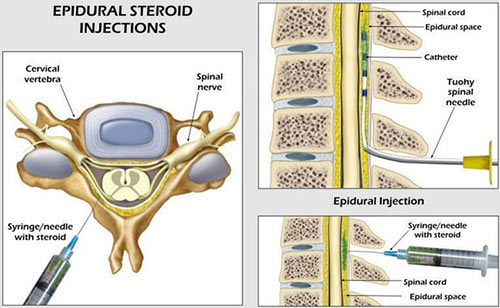 A cervical epidural cortisone shot is aimed at your cervical spine, which encompasses the nerves, bones, muscles, tendons and ligaments in your neck. Once your sports and pain medicine physician diagnoses the source of your discomfort, after he’s sure that you’re a suitable candidate for a cervical epidural cortisone injection, you can get the pain relief in the Midtown Manhattan office of the Sports and Pain Institute of NY. While your neck may appear to be a fragile network of soft tissue and bones, it’s really quite sturdy. It has to be to support your head, which weighs an average of 10 to 11 pounds. And your neck’s in constant motion, even when you’re sleeping. If your work requires you to turn your head frequently or you play a sport that places pressure on your neck, such as in football, martial arts or gymnastics, you may be at a higher risk for developing neck pain. Sleeping wrong. An ineffective pillow that doesn’t properly support your head can lead to chronic neck pain. Herniated disc. This can happen from an injury as well as from the natural course of aging that wears down the discs between your vertebrae. Improper posture. Pain radiates from the tendons and ligaments in your neck after years of poor posture. And with the rising popularity of mobile devices, “text neck” is rapidly becoming a reason many young people in NYC seek help for neck pain. Holding a phone between your chin and neck is another odd position your neck doesn’t like. Osteoarthritis. Bone spurs, inflammation and pinched nerves are common side effects of arthritis, all of which cause pain. Repetitive motion. Sports such as swimming and dancing often require that you repeat the same head moves over and over, leading to neck pain, muscle spasms, and even shoulder pain. Spinal stenosis. This condition usually is associated with radiating pain to your shoulders, arms and wrists. An x-ray, myelogram, MRI, bone scan or nerve conduction test help your NYC pain doctor properly diagnose your neck pain. You need an accurate diagnosis before your receive a cortisone shot for your back pain. Anti-inflammatory medication is the cortisone steroid that’s injected into your neck to relieve pain. In your doctor’s office, you’re positioned lying face down. An area above the site where the cortisone shot will go is anesthetized. Then, a larger needle is inserted into the epidural space by the nerve that’s irritated and causing your discomfort. Most side effects dissipate within a couple days. Your cervical epidural steroid cortisone shot recovery typically takes two to five days, after which the steroidal pain reliever continues to provide substantial pain relief for months. During your cervical epidural cortisone shot recovery, if you develop loss of feeling in your arms, fever or loss of bowel control, seek emergency care immediately. Do you have any questions about the cervical epidural injection cortisone shot we offer in NYC? 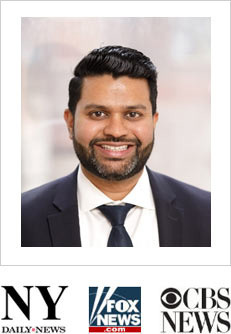 Would you like to schedule an appointment with the best rated neck doctor Febin Melepura MD of sports injury and pain management clinic in New York City? Please contact our office for consultation with the top neck pain relief specialist in Midtown Manhattan.